A four-piece quartet with three men writing and singing their own songs, and the drummer backing them up, Portland, Oregon's whiskey-soaked, beer-drinking, bar-rock powerhouse Moonshine Hangover do the south good. Delivering a debut that proudly flies the country-rock flag, these four gentlemen write tales of drinking, women, and misery, all tackled with the bartender's medicine. From "Swamp Song", which showcases the band's ability to write three-part vocal harmonies inside of a bare-bones rock song. To "Roadhouse Prophet", an engaging, blue-collar, working man's rocker, through the ballad "A Few More Miles", Moonshine Hangover are more than capable to write the soundtrack to your late night, blurry-eyed, staggering home drunk memories. Mulberry Squeezins only has a few rocky moments, kinks the band will work out on their sophomore record. 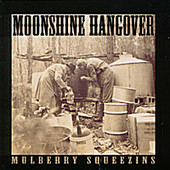 After all, you have to make a first record to make a second one, and for their debut, Moonshine Hangover comes out fighting and does it proudly. It's a valiant effort from a band that sounds like they'll write some gems in the future. I'll give it a B.